A daytime, Monday to Friday, Volunteer Driver Service for citizens of Salmo/Ymir and surrounding areas who require assistance to access medical, dental and some financial appointments. Once a person is referred by their doctor, they can call our Coordinator indicating the date, time and location of their appointment. The Coordinator will check availability of the driver and then arrangements will be made for the appointment requested. The participant is responsible for paying the driver an expense honoraria directly. Service is provided to individuals referred to the program by a medical practitioner or community support worker. Self referrals are accepted if supported by medical or community service professionals. Once participants meet screening criteria, they are registered with the program and can book appointments independently. Participants using the service pay an expense honoraria directly to the driver. This program is funded by Interior Health Authority and Columbia Basin Trust through DOT night funds. 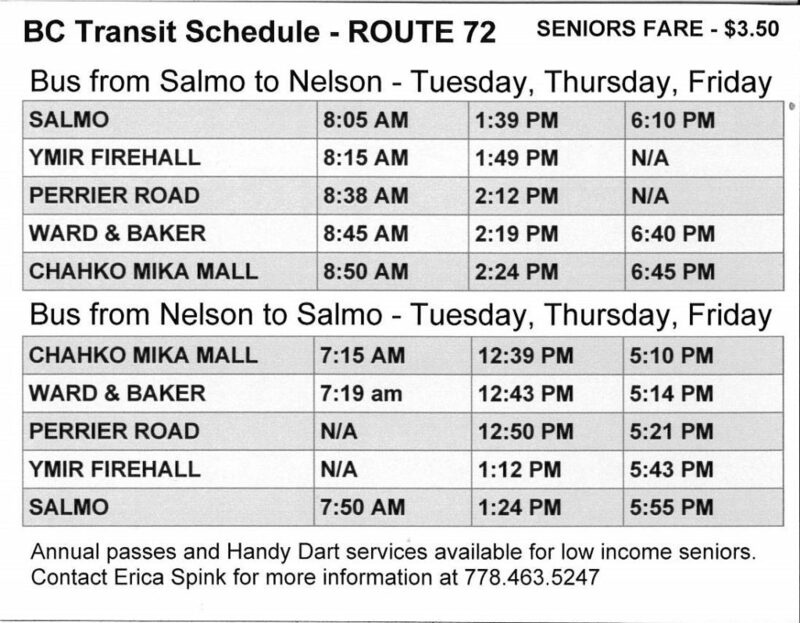 Transit system is currently available Tuesdays, Thursdays and Fridays. Please see website for further information.